First things first: What is the job of the heat exchanger? Just what is it? The simple answer is that the heat exchanger is the part of a gas furnace that actually heats the air. The general definition of heat exchanger (they’re found in many appliances) is a component that allows heat to pass between two liquids or gases without letting the two come into contact. The heat exchanger in a gas furnace is built to be sturdy and sealed. But cracks can happen because of years of stress on the metal. Each time the metal heats up, it expands, and then it contracts as it cools off. This may lead to weakening of the material and the development of cracks over years. This is one of the reasons we recommend replacing a furnace that is more than 15 years old, even if it still appears to be working well. If a heat exchanger cracks, you may start to hear a clicking noise when the blower fan shuts off. Call for repairs ASAP when you hear this noise and shut off the gas to the furnace. If your CO detectors go off, have technicians examine the furnace after you’ve left the home and had the gas company check for safety. Regular maintenance is also a time when technicians will closely examine the heat exchanger to catch cracks or spots of corrosion. A cracked heat exchanger must be replaced, or the furnace replaced. 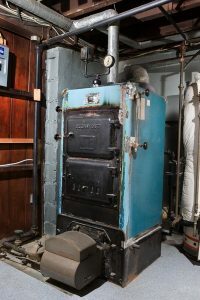 For an older furnace, we strongly recommend that latter. But you can trust our professionals for the best advice on heating in Haughton, LA. Hall’s Heating, Air Conditioning & Refrigeration serves the Shreveport, LA area. Reach out to us for all your home heating needs.